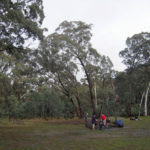 There’s a saying that ‘you don’t have to be mad, but it helps’—but at 9.30 on Sunday morning it seemed that you really did have to be mad to embark on FOBIF’s June walk into the Tarilta valley. Six degrees, a fine rain and forecast of possible hail: none of this was encouraging. All the same, eleven heroes rocked up, and were rewarded with a great experience in the remote valley, one of the region’s jewels. The weather turned out to be bluffing, too, obligingly moderating for morning tea and lunch breaks, with the suggestion of sunshine at regular intervals. 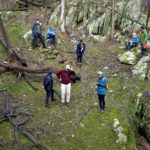 Our thanks to walk leader Jeremy Holland for guiding the group along a terrifically interesting route into the valley from the north; and of course the advantage of rain is that it gave a trickle of water over the area’s two very picturesque waterfalls. Fungi and mosses were in abundance, and the grand Candlebarks along the valley floor seemed even more spectacular in the misty weather. The focus of next month’s walk, in the Gowar Forest, will be ‘walking with birds’. Check the program for details. During the walk there was lots of discussion about fungi. This old TED talk is fascinating and promotes the need to save old growth forests. Thanks everyone who expanded my knowledge on this walk. 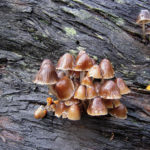 More recent article on Fungi. Great day Jeremy. 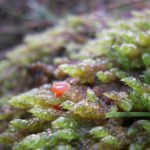 The very damp bush was carpeted in verdant green mosses, lichen crusts and fruiting fungi accompanying some healthy plant communities just waiting for spring to show their wares. 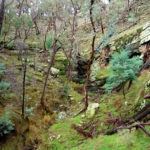 On our ‘approx’ 8 km trek, we walked along tracks and creekbeds, diverted across country, up and down gullies to trickling waterfalls and a quietly spectacular rocky gorge. 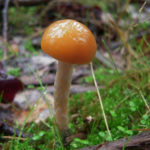 Birdlife was noticeably absent but fungi were everywhere – White Punks and other look-alikes, Ghost fungi, Rooting Shanks, Yellow Brain, Scarlet Brackets, Rainbow Brackets, Pretty Horn, beautiful little ‘bonnets’ or Mycena spp., robust Amanita and Agaricus spp. as well as lots of LBMs. What a gem of a place! Thanks Jeremy. Did anyone look up the exotic native Hakea we chanced upon? Was it Hakea salicfolia?